Chocolate Fountains Delite - Gourmet French Chocolate cascades off of each layer as guests dip fresh fruit and other items into the chocolate flow. nbsp;Add a fountain to your next event and make a lasting impression! Chocolate Fountains Of Sacramento - Turn your special occasion into a spectacular event. nbsp;Add a chocolate fountain to delight all the senses of your guests! Energy Unlimited - Indulge yourself in the ultimate chocolate experience. nbsp;Chocolate fountains make the perfect addition to any wedding reception! 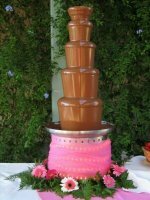 The Tower Of Chocolate - We will provide a Chocolate Fountain with flowing gourmet chocolate for dipping your favorite food items at your Wedding Reception.